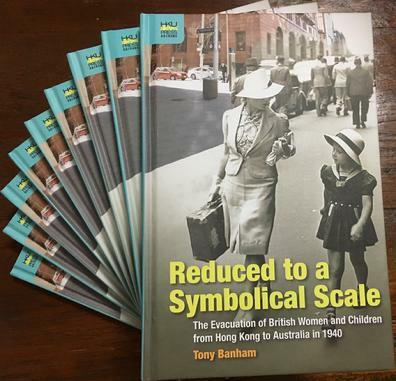 This page covers the fourth book, Reduced To A Symbolical Scale which studies the 1940 evacuation of British women and children from Hong Kong to Australia. In July 1940, the wives and children of British families in Hong Kong, military and civilian, were suddenly and compulsorily evacuated to Australia, following a plan created by the Hong Kong Government. Unfortunately that plan – triggered by fear of Japanese invasion - was purely focused on getting them away from the Colony, and gave no thought to what might happen once they arrived in their new home, or once Japan actually entered the war. Based on archival research of official documents, letters and memoirs, and interviews and discussions with more than one hundred evacuees and their families, this work is the first publication to study this evacuation, and it does so within a deep understanding of Hong Kong’s wartime experience. Continuing the story to 1945 and beyond, it examines the experiences of the evacuees, many of whose families were permanently damaged by war and separation, and some fifty percent of who eventually made Australia their permanent home. The reader will be interested in Australia’s immigration history, Hong Kong’s wartime experience, civilian evacuees of the Second World War, the effect of that war on families and marriages, and the echoes of those times still visible in Australia and Hong Kong today. Read a review in the Asian Review of Books. The book can be purchased from Amazon UK and Amazon US.